And then we looked around and realized how depressingly barren our house is. We have zero replacements for our Christmas decorations. Anyone have any awesome DIY ideas?? 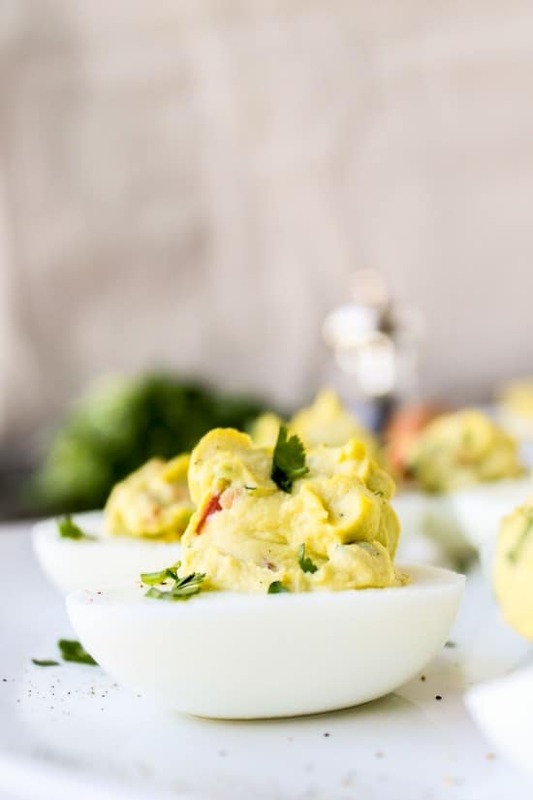 Have you guys tried deviled guacamole eggs? This was the first time I have made them, and I don’t know why, because they are amazing. 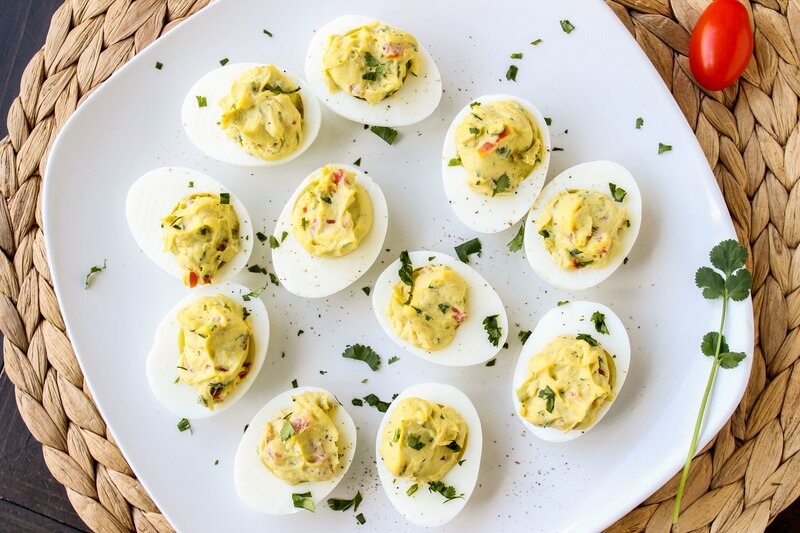 I mean, deviled eggs plus guacamole? How could it get any better than that. 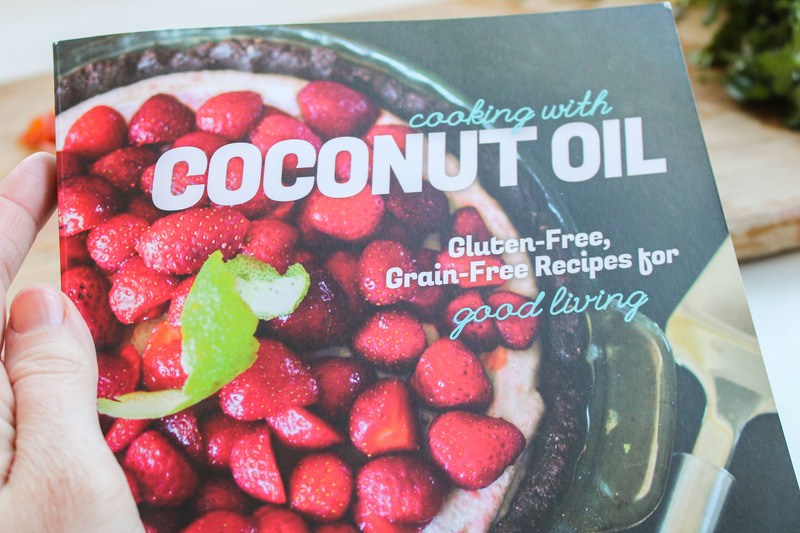 The recipe is from the brand new book Cooking with Coconut Oil by Elizabeth Nyland, who blogs over at Guilty Kitchen. It just came out Monday! 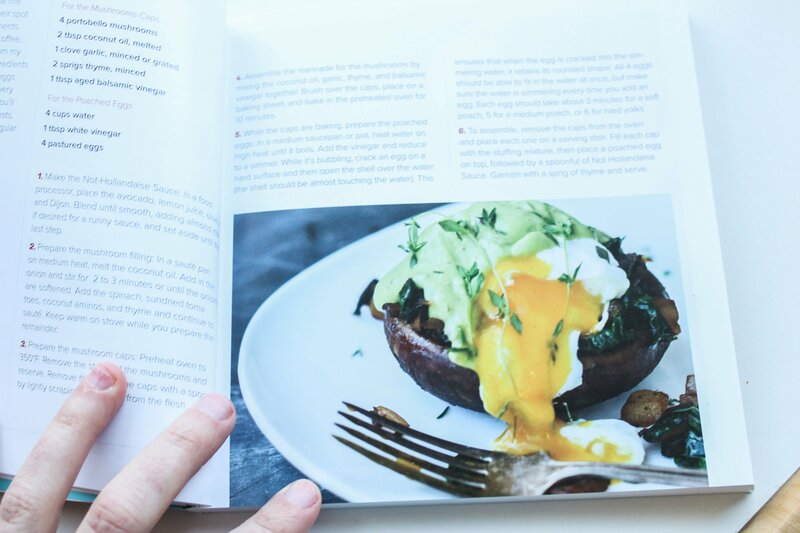 She makes amazing “paleo-ish” recipes, which are mostly gluten and grain free. 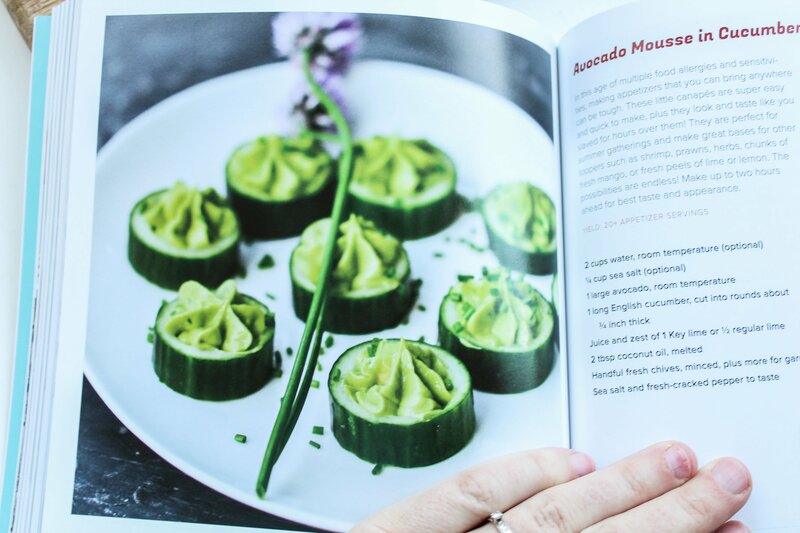 She is a fabulous photographer and whips up some pretty amazing looking food, you should definitely stop by. Or buy her book! It’s only 13 bucks, and there are some really great ideas in it, especially if you eat paleo or have diet restrictions. 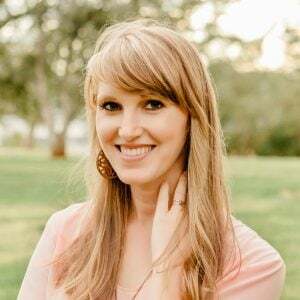 Elizabeth is a fellow member of the Culinary Content Network at the Daily Meal, so I thought I would give her a shout out. Want a sneak peak? I seriously want to try this Avocado Mousse in Cucumber Cups. 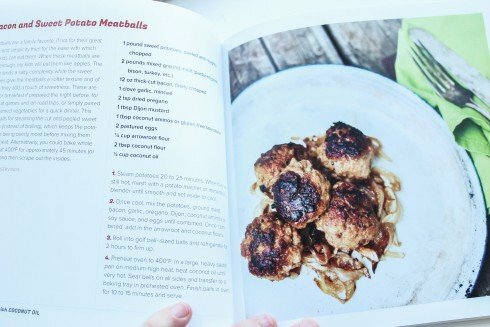 Bacon and Sweet Potato Meatballs!?? I’ll take 3…dozen. Also, have you guys ever steamed eggs to hard-boil them? AMAZING. I don’t know why I’ve never heard of this before, I’ve seen people do everything from adding baking soda to the water, to baking them, to adding salt, but I’ve never heard of steaming them. The most perfectly cooked eggs I have ever had. They were so moist; just barely cooked, and just the right shade of yellow. And they were ridiculously easy to peel! I had no casualties, not one. Usually I am the one trying not to tear my eyes out after I shred every last egg white to pieces. 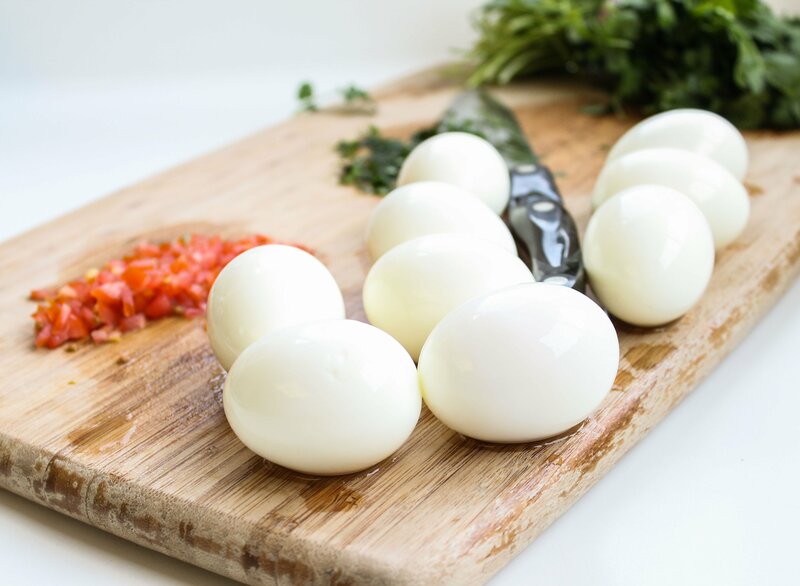 I will never cook hard-boiled eggs any other way, ever! There are some how-to shots below. Note: Elizabeth’s publisher sent me the book for free, but I received no other compensation for this post. All opinions are my own, of course! Peel the cooled eggs and cut in half. 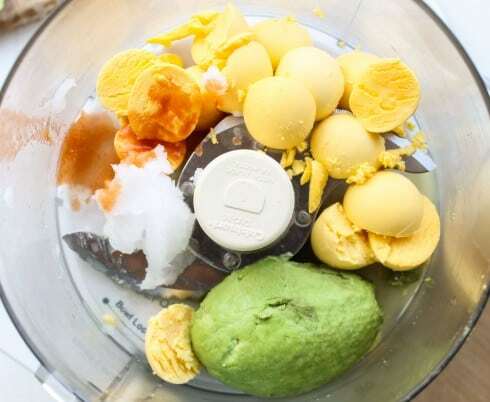 Put the yolks into the bowl of a food processor, blender, or bowl. 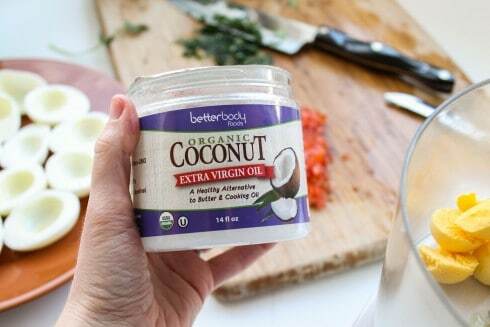 Add the avocado, lime juice, coconut oil, and hot sauce. 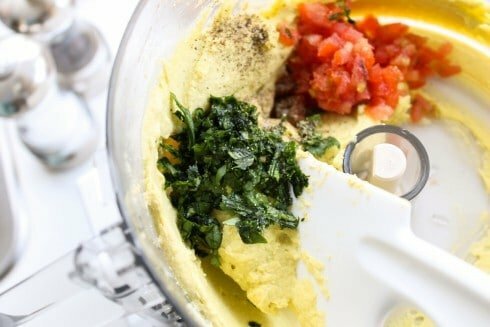 Pulse until smooth, or mash with a fork. 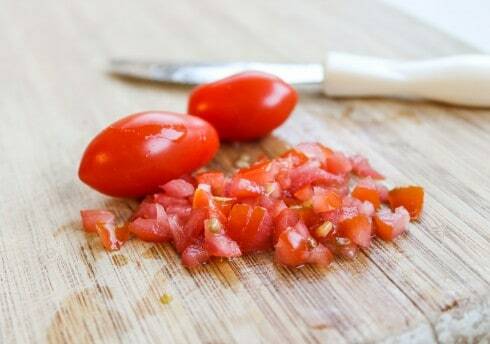 Stir in the tomatoes and cilantro, and season with salt and pepper. Spoon the filing into the whites and garnish with extra cilantro. Serve immediately. If you are serving them later, store them in the fridge but let come to room temperature for 30 minutes before serving. 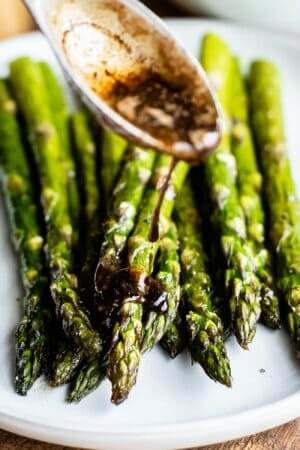 These have avocado in them, so they will brown if you wait a while before serving. Cover them tightly. 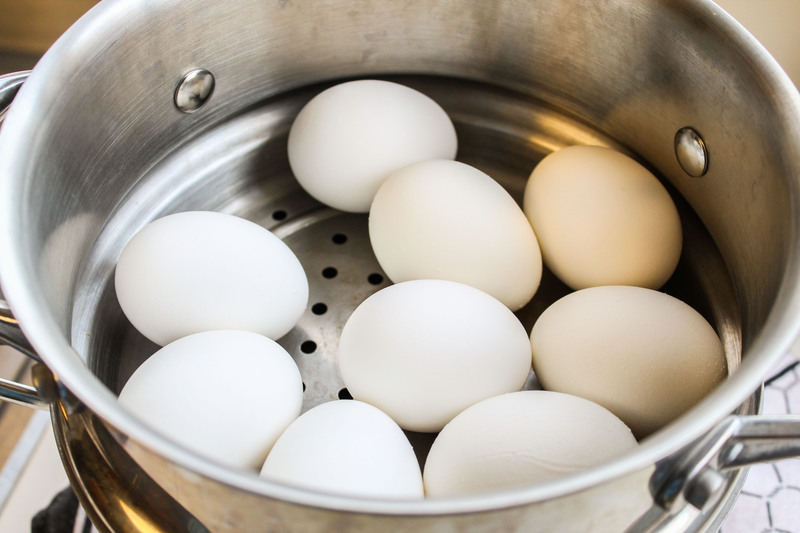 Add your eggs to the steamer and cook for 12 minutes. So easy! Plus the eggs don’t bump around, so there’s no chance of cracking. Plunge them into cold water. Look at how beautiful they are! No blemishes! Perfectly peel-able! I like my tomatoes minced very small. Thank you for once again improving my life. 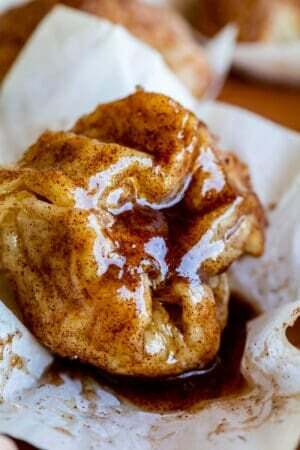 Now I’ve got to go tell the ladies in the backyard to increase their egg production so I can make this recipe for Saturday’s Colts game. Yes, I’m so glad you tried it Ami, now I have back up that I’m not crazy!! And yes, get your little hens producing more. 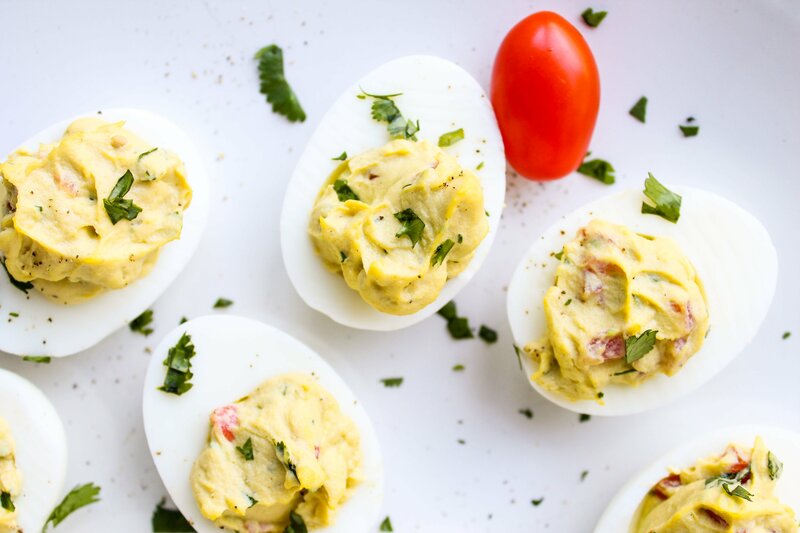 I think we could all use more eggs in out lives. Just don’t tell them you will be eating their unborn children. 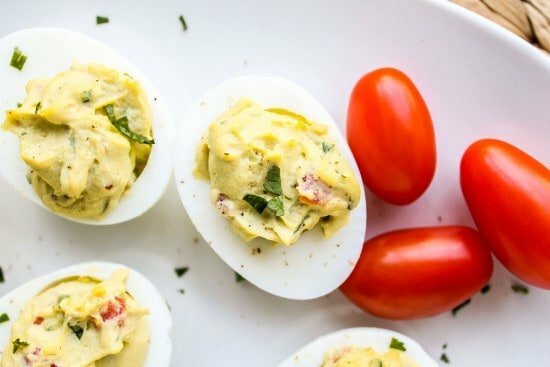 You’ve never made deviled eggs???????????????? How do you make it through Easter every year? 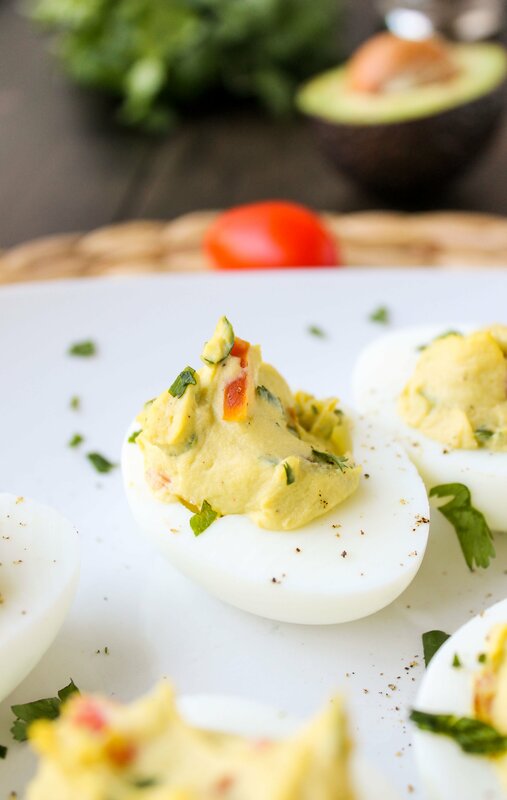 I’ve been wanting to make guacamole deviled eggs for so long, and I don’t at all mind that you beat me to it. These are beautiful! We still have some decorations up too, but only because we missed them when we packed up…oops! Hehehe…that is indeed how I roll. Is step #3 supposed to include the avocado and coconut oil? I didn’t see those added anywhere. And yes, the steamed eggs are new to me as well! Looking forward to trying this recipe. Oh my gosh Connie! I forgot like half the ingredients!! FAIL! Thanks so much for catching that and telling me. Let me know if you like it! 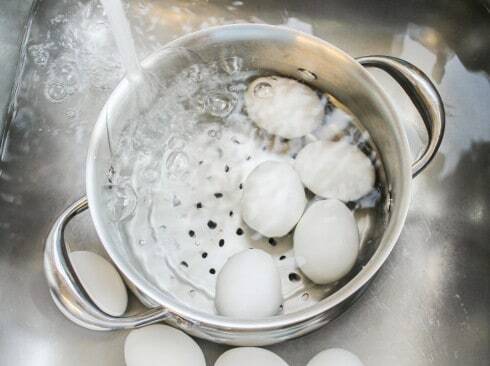 Steaming the eggs is a great idea! I’m so excited to try it! Its another one of those, why have I never thought of that, things. It totally works Misty. I was flabbergasted to say the least. 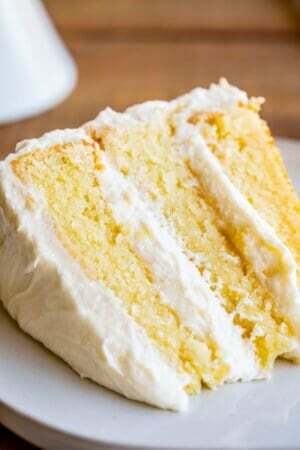 So moist! So yellow! Gorgeous pics Karen, and I love the idea of steaming the eggs instead of boiling! Thanks Julie! High praise coming from you! First, I don’t think you could call a “dance party” a “party” if you don’t have N’Sync. Maybe a “cotillion”. I do however think this recipe would get some attention at both. haha Linda. I would normally agree with you, but you obviously didn’t click on my Pink Martini link. They are amazing!! I actually think you would totally love them. Of course, I thought Pink Martini was a Pink Martini, which I thought would be a perfect part of dance party. I’ve never heard of steaming your eggs to hard boil them either, but now I must try! 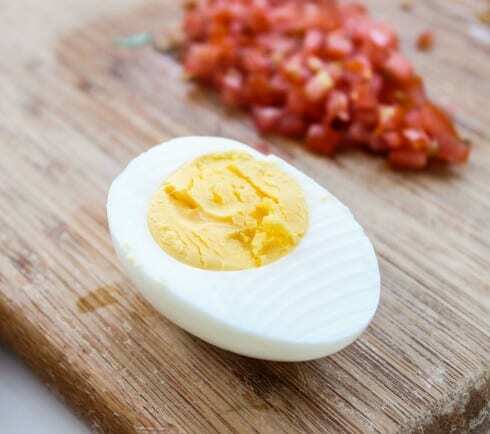 I love a perfectly cooked hard boiled egg. 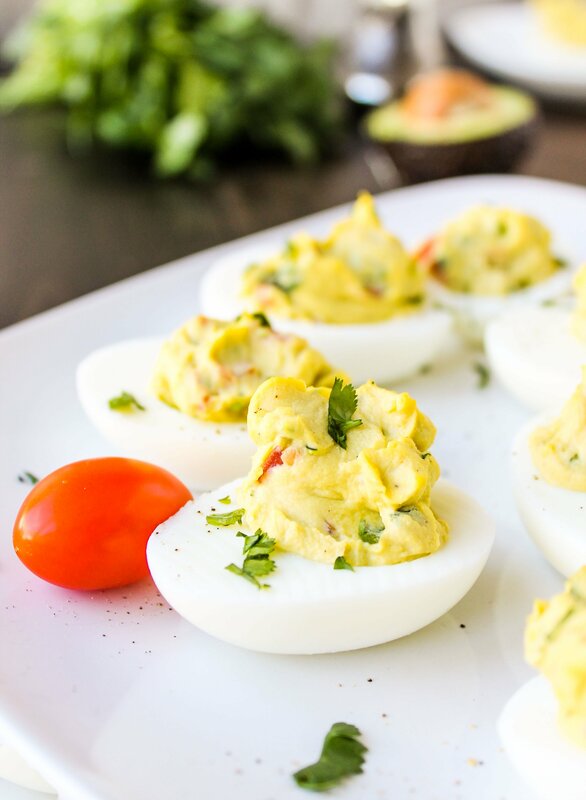 And these deviled guac eggs looks like perfect use for them. And if you house is feeling a little “undecorated” you could whip out the valentine decorations! Guilty!! You totally called it Natalie!! I already HAVE Valentine’s decorations up! I was too embarrassed to admit it. 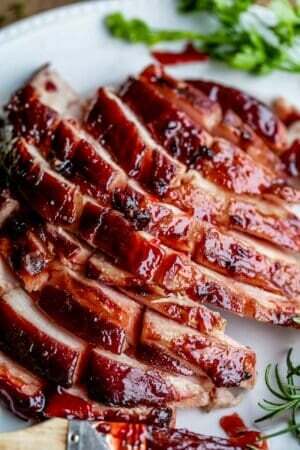 And yes, try the steaming…I’m never going back! You’ve got to try it Laura! They were so good, even before I deviled them. So moist! !